The Huron City School District is carrying out their legacy as a district of “Excellence” in saving energy with The Green Apple Project, an innovative program of the Brewer-Garrett Company. 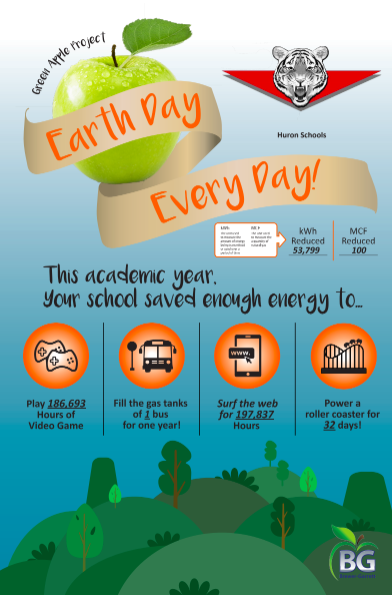 This energy conservation program is driven by a combination of operational efficiency improvements and behavior changes of the districts staff and students. The benefits to the school district and community go beyond the cost savings and include a sustainable education curriculum which supports a sustainable culture shift. “We are all proud to be part of a project that has such a great return with no upfront investment by the district, except for time and commitment to the new processes”, adds Dawn Jacobs, CFO/Treasurer for Huron City Schools. The daily operations of the Green Apple Project are led by an Energy Coach who is already familiar with the buildings and staff. The Energy Coach for Huron Schools is Phil Brickner who has served in various administrative positions within the district over the past few years. Phil is an employee of the Brewer-Garrett Company while he leads the district in achieving their energy savings goal of $28,668.